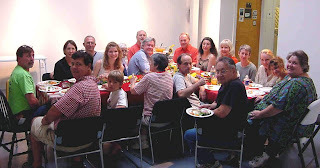 After three successful weeks of viewing, 80808 on 80808 came to a close on Tuesday, August 26 with a “potluck” dinner thrown in an artistic fashion. 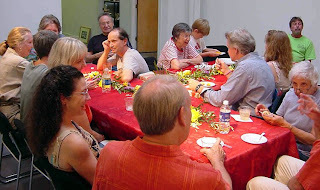 Heidi Darr-Hope dressed the tables with exotic fabrics and a spread of fresh flowers. Everyone brought a dish, including Pat Gilmartin’s amazing sweet potato salad. 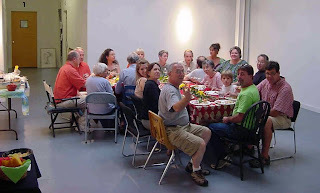 There was wine and soda, sweet tea and coffee, plenty to eat, and great conversation. 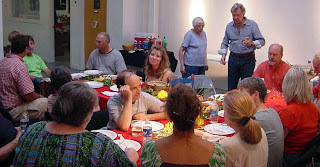 David Yaghjian pulled out his camera and tripod, set the shutters for a delayed snap, and took these pictures of current studio artist and past studio artists enjoying the evening. 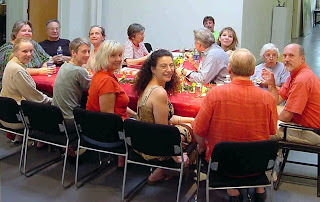 From left to right, working around the back of the table to the front: Gene Spears, Ellen Yaghjian, David Yaghjian, Clare Yaghjian, Bruce Bahr, Steve Dingman, Christian Thee, Susan Lenz, Sharon Licata, Pat Callahan, Pat Gilmartin, Heidi Darr-Hope, Michel McNinch, Don Zurlo, Jeff Donovan, Ben Williams, and Mike Williams.